Elissa Brown - a.k.a. Lissa Quon - is the Foolish Mortal. Lissa emerged from Zeus’ skull fully formed with a pencil in hand and a bowler hat on her head. Shortly after this miraculous birth Zeus took two aspirin, got distracted, and forgot all about it leaving her to wander off to her own devices. Other sources report she was found on the doorstep of a haberdashery and raised by mad hatters. Even others claim that she was instead born in Texas and raised the usual way. After discovering a knack for drawing things and making stuff up as she went along Lissa decided to study art and spend the rest of her life covered in ink and pixels. So far she has yet to really regret this. 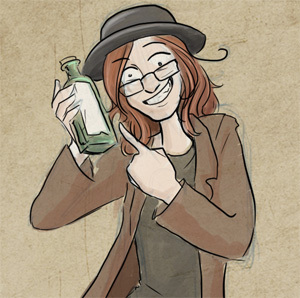 Lissa has travelled the land with her faithful hat selling her art at whatever conventions and venues will take her. She also does commission work and has done work for board games, websites, small businesses, and satanic newsletters. When she has spare time Lissa likes to write in the third person, play video games, watch horrible movies, and read books about dead people.